We all experience times when motivation is lacking. I love cooking for its creative outlet, but the nightly ritual of getting dinner on the table can be a chore. Sometimes, feeding one’s family feels like a monumental effort. Even for me. Of course, we still get hungry and, sadly, there is no Dinner Fairy. Pouring a big bowl of cereal can be tempting but won’t do for the long haul. It definitely won’t satiate my two growing boys, even for the short haul! The following recipe is a solution to kitchen burnout. It practically cooks itself. With the exception of the fresh cilantro, everything can be kept easily on hand. In a pinch, frozen chicken can be added directly to the slow cooker, so this meal will work even if you forget to thaw the meat. In this case, the cooking time will need to be increased to ensure the chicken is completely cooked through the center. To reinvent leftovers, I often make tacos. If I have extra rice from the first night, I’ll stir it into the chicken mixture. The rice will absorb the leftover juice and create a thick, flavorful “stuffing” for a taco. Cooked quinoa, couscous, or almost any grain may be used in place of rice. Another way to repurpose leftovers is to whip up a Mexican-inspired chopped salad, piling the chicken mixture atop romaine lettuce or greens of choice. Add your favorite taco-type toppings, like tomatoes, cucumbers, black olives, avocado, shredded cheese, and salsa. For a delicious 2-ingredient dressing, try mixing equal parts salsa and ranch dressing. (To print my homemade buttermilk ranch recipe, click here.) Alternatively, the leftover chicken mixture can be used for enchiladas. For those who may not be a fan of cilantro, simply omit it. (Have you ever heard that some people have a gene that makes cilantro taste like soap to them? Apparently, there are genetic differences linked to the sense of smell.) Whatever the case, this meal is worth making even if you leave the cilantro out. In lieu of the cilantro, chopped parsley will add a welcome hint of freshness. 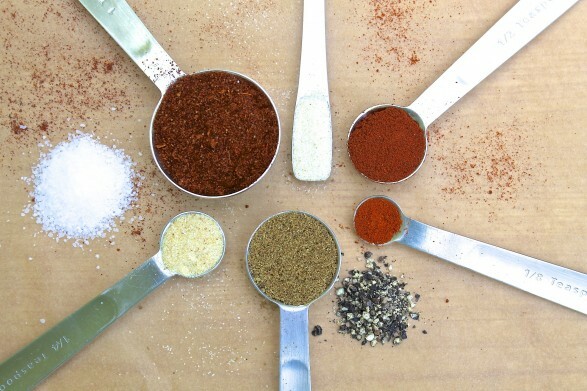 For additional details and uses for the homemade taco seasoning, click here. Though listed as an optional ingredient, black beans provide extra substance and flavor to the meal while ratcheting up the health profile an extra notch or two. In a slow cooker, mix together the salsa, lime juice and zest, taco seasoning, and optional black beans and jalapeño pepper. Add the chicken and flip to coat with the salsa mixture. Cook on low heat for approximately 6 hours (or 3 hours on high) or until the chicken is cooked through. At this point, you may remove the chicken to a plate and shred with two forks before returning to the slow cooker. Or you may serve the chicken breasts whole. Stir in the 1/4 cup cilantro and serve over rice or your grain of choice. Sprinkle with cheese, and garnish with additional cilantro, if desired. The weights of boneless, skinless chicken breasts can vary substantially. You may cook 6-8 chicken breasts halves at one time if you prefer to serve them as whole breasts or make extra for leftovers. I based the recipe on chicken weight, however, in order to have an adequate chicken-to-sauce ratio, which is more important when shredding the chicken and mixing it back into the sauce. Many salsa jars are 16 ounces, so you could use 1 1/2 of this size jar. Choose mild, medium, or hot according to preference. In a small bowl, mix together all the ingredients. Store in a small jar or other airtight container if not using right away. Good morning Ann! 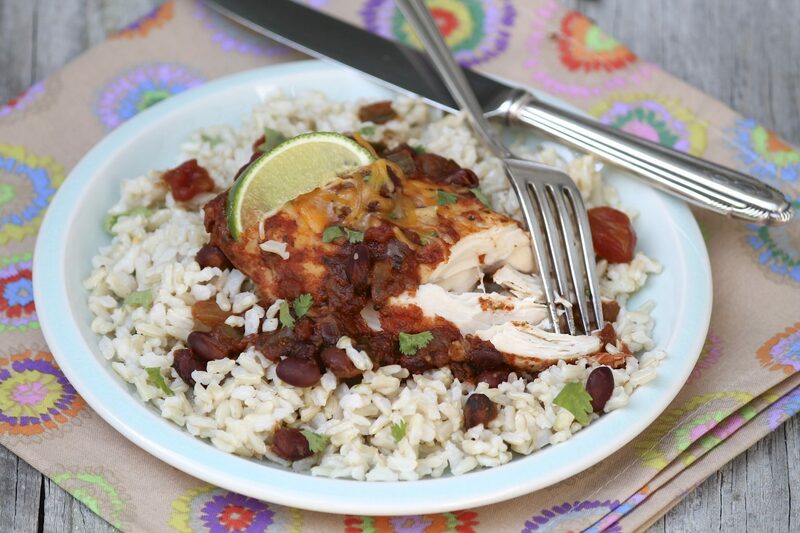 This looks wonderful and a nice switch to my usual chicken with just salsa. Since I’m working lot of overtime and Saturdays next few weeks I need slow cooker meals I can plan ahead for. This is going on my list for sure. It will be perfect to come home to after a long work day, Mary Lou. I hope you enjoy! After reading the Sunday paper, I made this meal for us for dinner! Yes, even I could make this one, and everyone loved it! Thank you, Ann. I love your easy options! Thank you for your terrific feedback, Deb. I am so glad this was a success! Ann I’m making this tomorrow. My question is, will it be ok to cook for 8 hours? That is the shortest time I can do sine I leave really early and won’t be home until later. Hi Mary Lou, The chicken will be very tender after that time, but it should still be fine (especially easy to shred). If you happen to have a slow cooker that switches to a warm setting, you could cook on low for 3-4 hours and then let it transition to warm, as it still cooks a little on the warm setting. Let me know how you make out! I made your recipe on Monday after seeing it in Sunday’s newspaper. It was delicious. We’ve been enjoying the leftovers all week! I made some quinoa to add to mine and then for the leftovers put it over some organic romaine with an avocado…really warms up a salad on these cold days! Thank you for your kind feedback, Leslie. I am so happy to know you tried and enjoyed! Your leftovers sounds terrific, too! Easy, healthy, and really good! AMAZE BALLS ! My wife is avoiding nightshades as well as gluten, so no tomatoes or peppers (sweet, hot,tomatillas). What can substitute for the salsa … chicken broth and extra lime juice? I’d also have to improvise on the taco seasoning, but that’s less of a concern. Since the list of nightshades includes many of the ingredients in this recipe, it may be hard to mimic the flavor. But I think you could create something equally delicious, using different ingredients. Seared Sesame Chicken and Lime Honey Chicken are two recipes on this site that I really enjoy. You could play with those flavors for use in the crock pot. Also, the following recipe for Wicked Good Chicken is delicious and may lend quite well to a slow cooker. I will keep thinking of different ways to make this recipe, too! I’ve made this recipe several times – delicious! The fact it doesn’t take much effort is an added bonus. It freezes well; is great on rice, salad and in tacos or tortillas. I always add the optional beans and jalapeño. I’ve also made it to take to a friend who had family staying with her for a funeral – several asked for the recipe and I was happy to direct them to this web site. That’s so good to hear, Elaine. Thanks you for the thoughtful feedback, and how kind of you to make some to give away. I’m sure it was most appreciated. Ann, I just love this recipe! I had to pin it so I’ll remember to try it. It would be so marvelous for chicken tacos. It’s wonderful in tacos. Thanks for pinning, Ann! We make this every week now. So yummy, and gives us meals for 2 days of the week. Cooking once and eating twice is always welcome here. I’m so happy this has become a regular! I love the combination of healthy and delicious ingredients, Ann! This is my cup of tea! Thank you, Agness. So glad you like! This has been on the weekly rotation for over a year now. Easy and delicious! I’m thrilled this has become a staple in your house! Hey Ann! I just made your cilantro lime chicken today. It was good! And I loved how easy it was and I might try it with ground beef too. Do you think this would work? I’m glad you liked the chicken! You could definitely try it with ground beef as all the flavors are complementary. I think that would also be a great base to add additional ingredients like tomato, avocado, cheese, black olives, crushed tortilla chips, etc., if you like. Also, I think I might skip the slow cooker and sauté the ground beef on the stovetop, allowing it to simmer with the salsa and spice mixture for a short time.